I get a lot of questions about over-wintering geraniums. It does seem a shame to pull them out of pots and gardens and discard them, so here are several ways to keep these plants going. With a little effort, you can enjoy them again in the garden next year. You can grow them indoors in pots, or take cuttings, and – only if you have the right conditions – try the old method of hanging them up bare-root in your basement. west-facing window or set them under plant lights. While they’re growing indoors, they do best if the potting mix is kept on the dry side, so water just once a week. In late winter when the days start to get longer, and new growth shows, begin to add fertilizer to your watering. When spring comes, be sure to allow your over-wintered geraniums to get used to outdoor conditions gradually by hardening them off. The how-to is explained here. Geraniums are among the easiest plants to grow from cuttings, so if you don’t have to space to over winter larger pots in the house, try growing them from cuttings. Fill clean 4 inch (10-cm) plastic nursery pots with lightly moistened potting soil. The potting medium should be lightly moist, but not wet. You need one pot per cutting. Or you can use Jiffy pellets, like those shown in the picture. Snip off healthy-looking stems about 4 inches (10 cm) long from near the top of the plant. Break or cut off lower leaves flush with stems, and remove any flower buds, leaving a set of leaves at the top. Dip the end of each stem in rooting hormone powder, (available at garden centers). Shake off excess. Make a planting hole in the potting soil with a pencil. Stick cutting in, and gently firm soil around it. To keep humidity high, put a small plastic freezer bag or sandwich bag over top of the pot and secure with an elastic band. Set cuttings in a bright area, or under florescent lights, but not in direct sunlight, until they have rooted. Rooting takes about three to four weeks. When you start to see new growth, that’s a sign your cuttings have rooted. At this time, remove the plastic bag and begin watering regularly, but don’t over water. 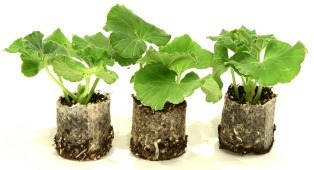 Start to give your rooted cuttings half-strength fertilizer once a week after they have rooted. Keep them under florescent tubes or grow lights or in a bright window. 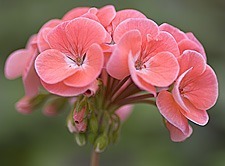 An old-fashioned way of over-wintering geraniums is to take them out of their pots, cut the plants back by two-thirds, remove soil from the roots, and hang them in your basement. Most modern basements are too warm and dry for this to work, but if you have a cool and dark cellar, you might be successful. If you’re keen to give this method a go, try to re-hydrate the roots in water for a couple of hours occasionally to avoid them getting too dried-out. In late winter, pot up your geraniums, and place them in window or artificial light, and when growth resumes, start giving them fertilizer.